But focusing on the whale can be a handy teaching moment to contest the popular notion of identity as being a stable, self-evident thing, instead of being continually shifting and contextually constituted by the relationship into which some item is placed. So, contrary to the way such a story inspires readers to see local officials as flippant or inconsistent — after all, the whale was ok last year! — it instead is a wonderful example of how identity is not about the item but how the item is used, by whom, for what purpose, and along with what else. For we all know that rituals are comprised of ordinary things that, when put into certain semantic settings, come to be seen by participants as significant in a whole new way, for a specific period of time, in a specific place, for a specific set of users. The whale strikes me as no different. So if you want to sell papers, and run up the number of hits on your site, then make it about the whale; but if you want to understand how social actors manage changeable space and our various places within it, then you’ve got to learn to look past the whale. 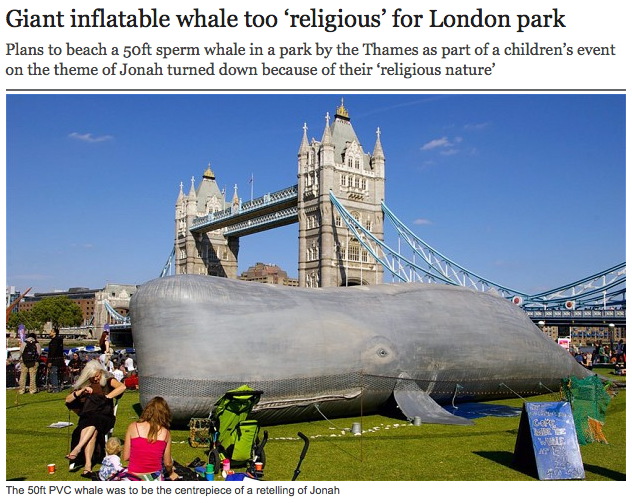 This entry was posted in Faculty Blog, Relevance of Humanities, Religion in Culture and tagged Identity, Jonah, London, Ritual, Signification, Whale by Russell McCutcheon. Bookmark the permalink.